Soft-Evolution Pimero - is an excellent calendar to record the possible meetings and contacts, which is suitable for both large organizations and for individuals. If you travel frequently or work for multiple computers Pimero offers you a unique opportunity to distribute your time schedule to suit your requirements. New features: Support Skype, import data into Microsoft Outlook, vCard (. Vcf) and iCalendar (. Ics), send e-mails. Working as part of your team, Pimero is a convenient appointment calendar and contact list manager - the ideal companion for small teams and individuals. If you are on the road frequently, work with several computers or bring together several people into a team, Pimero offers you unique benefits in appointment scheduling. With its automatic, serverless synchronisation, based on peer-to-peer technology, you need not give a second thought to how you maintain your appointments up-to-date. Every computer which runs Pimero synchronises automatically with all other computers in the network. Take your notebook with appointments and task list on trips - regardless of what you change whilst on the road, it will synchronize with what has changed in the meantime in the office or at home as soon as you re-connect to the network. Synchronisation works in both directions. If you often work in different places, you always have access to your personal login from all computers in the network. This means that you have your information readily available - anywhere, anytime. With its multi-user capabilities, you have the perfect tool for team-work. Display the appointments and task lists ofcolleagues, employees and friends next to one another - easily and clearly. Use the Team Meeting Finder to find available times for several users and specify who may enter and see other `s information. Protect your private domain with private entries which only you can read, irrespective of any other settings. Pimero places great importance on data security and automatically encrypts all transmissions. In addition, all of your personal data is stored on your PC encrypted. 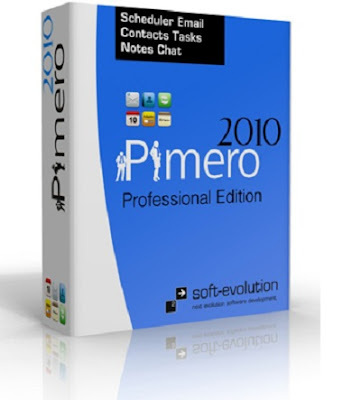 Pimero 2009 enables you to manage your appointments, contacts, tasks and notes. Within shortest time you won't miss this handy software anymore in your daily organisation and team structure. Beside lots of functions for own organisation of daily work, Pimero offers a rich set of team features. With minimal efforts you are able to work together with your team members and rise the production level of your company immediately. Every team member owns his personal calendar for his personal data like appointments, tasks or contacts. If your team member has the right to access your calendar, he simply can add it in his view by activating the calendar beside your name in the team members list. Additionally he can add, change or delete appointments, tasks etc. for you. Example: A secretary can enter appointments for her boss. Project managers can set up tasks for several team members etc. You see: There are lots of possible situations where Pimero will help you organize and structure your data.